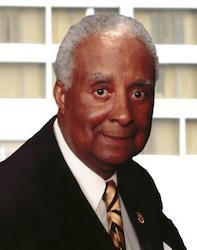 Dr. William H. Hayling – 100 Black Men of America, Inc.
Hayling was born in Trenton, N.J., in 1925. His father, a physician, died in 1939, but his legacy of caring for families inspired William to enter medicine. At 17, he was admitted to Boston University, where he took summer courses, tested out of requirements, found time to play varsity basketball and baseball, and at the age of 19 gained admission to Howard University College of Medicine. Upon graduating from Howard, Hayling completed an internship at Harlem Hospital in New York and began a residency in obstetrics. In 1951, he was drafted into the U.S. Army Medical Corps as a captain and was a battlefield surgeon with a MASH unit in Korea, earning a Bronze Star. After returning to New York, he completed his residency in obstetrics and gynecology at Lincoln Hospital in the Bronx. Over the course of his career, Hayling delivered more than 8,000 babies. He was in private practice in Newark, N.J., from 1957 to 1981 and was chief of ambulatory obstetrics and gynecology at Martin Luther King, Jr., Hospital in Los Angeles from 1981 to 1998, with a faculty appointment at Charles R. Drew University of Medicine and Science. After retiring from King/Drew, he oversaw the care of patients at a family medical clinic in Lynnwood, Calif. He is a fellow of the American College of Obstetrics and Gynecology and of the American College of Surgeons. Hayling is most widely known for his work outside of medicine. In 1963, he and several other community leaders, including David Dinkins, who later became mayor of New York City, and baseball legend Jackie Robinson, formed 100 Black Men. Hayling relocated and established a chapter in New Jersey and later in Los Angeles. The 100 Black Men movement grew as chapters were formed around the country. Hayling was elected the first national president and Chairman of 100 Black Men of America in 1986 and has continued to be a mentor and advocate for young people throughout his life.